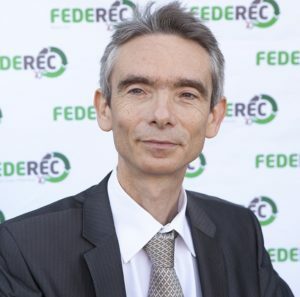 Trained as a materials engineer, I took over the General Management of FEDEREC in 2016, after a 25-year career in recycling, firstly at Renault and then at Derichebourg as the Environment Director. In addition to defending the interests of recycling companies, FEDEREC carries out various cross-functional projects such as the creation of a software on recycling CO2 savings or the Recycling Expertise Centre, which aims at the involvement of the various stakeholders in recyclability issues in the various economic sectors. FEDEREC is structured into 8 regional unions and 12 industry sectors, including the ones of plastics, paper and cardboard, ferrous and non-ferrous metals and glass, which all are relevant to packaging. Our member companies are active in both corporate markets -especially in commercial packaging- and in local authorities’ waste markets. Driven by ever more ambitious regulations, our industry is a vehicle for dynamic local economies. Indeed, nearly 28,000 direct and non-relocatable jobs have been created in France within a network of 1,100 companies made up of groups, SMEs and intermediate-sized companies that collect, sort and prepare waste to produce Secondary Raw Materials (SRM). FEDEREC joined the CNE this year as a member of its 4th college: could you explain us what motivates FEDEREC to support the CNE and its actions? The packaging industry is at the heart of many challenges related to environmental requirements and changing consumption patterns. In this context, it is important to bring the different stakeholders in the packaging value chain together. Recyclers, thanks to their expertise and knowledge of the real recyclability of products, are a key link in this chain and play a major role in the incorporation of recycled raw materials into new products. They can play a valuable role in the eco-design of packaging and in particular in the recyclability assessment. It was therefore important that recyclers could effectively contribute to the work of the CNE, alongside other stakeholders such as marketers. You actively participated in the CNE working group “Packaging after consumption of the product”. – What do you think of the animation of this WG and the resulted document? – Do you have any suggestions for improvement? We are glad to have participated in the development of the CNE Report on “packaging after consumption of the product”. The content is particularly qualitative and makes the gathering of key information specific to the packaging industry possible. Concerning the method used for this report, involving all stakeholders depending on their expertise enables to deal with the various aspects of the subject. However, in return, vigilance is needed to guarantee the overall coherence of the final document so that messages are well understood. The CNE listens to its members. What are the main emerging or non-emerging themes which the CNE could investigate in its future working groups? We are very pleased that a WG on the incorporation of recycled material is being launched by the CNE as a coherent follow-up to the report on the end-of-life of packaging. Indeed, the use of recycled raw materials is an environmental priority to promote better practices in industrial production that would consume less of the planet’s natural resources. This is actually the first objective of the “Circular Economy” Roadmap with specific regard to plastics. In addition, the development of outlets for recycled raw materials is of course an essential condition for developing the recycling chains. Indeed, in the absence of a viable economic model, some materials often used for packaging are suffering from a lack of outlets and are therefore not recycled. The CNE’s assessment of the qualities, quantities of materials and commitments of the various stakeholders will allow us to strengthen the momentum initiated by the “Circular Economy” Roadmap and the voluntary commitments that have followed. In the future, the CNE could look at household and also industrial and commercial packaging EPR systems -in accordance with the guidelines adopted by the Ministry-, the extension of sorting instructions to all plastic packaging, etc.